President Donald Trump accepted the assessment of the U.S. intelligence community that Russia meddled in the 2016 presidential election and said he misspoke during his Monday press conference with President Vladimir Putin. 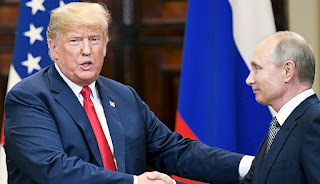 Trump’s appearance with Putin drew bipartisan criticism after he appeared to give some credence to Putin’s claim that he did not interfere in the 2016 presidential election, despite being told the opposite by his intelligence community leaders. “I have confidence in both parties,” Trump said, adding that he didn’t see any reason why Russia would interference on his behalf. At this point, I feel a little bit sorry for this idiot. Or I would if the consequences of his stupidity were not so grave. BTW, the DAILY (LIAR) CALLER failed to mention that Trump said it could have been other people also . . . . HAHAHAHAHAHAHA and that he scratched out the line he was supposed to read that said he would prosecute anyone involved in election meddling. Trump just can't help himself. The only thing worse than Trump are his enablers in Congress. EVERYTHING I SAID ABOUT TRUMP in 2015-2016 HAS BEEN PROVEN TRUE. You people who voted for him have a lot to answer for. But Gorsuch? No sorry, that doesn't work.